Supreme Court of India will pronounce the Judgment Tomorrow on petitions filed by Five eminent citizens led by Professor Romila Thapar against "arbitrary arrests" of human rights defenders including Sudha Bharadwaj and Gautam Navlakha citing "Maoist links" in the Bhimakoregaon case. Protesting the "arbitrary" arrests, the petition said the arrests were made without a shred of evidence and alleged that an emergency-like situation existed in the country. The petitioners demanded a Court monitored SIT probe in the matter. 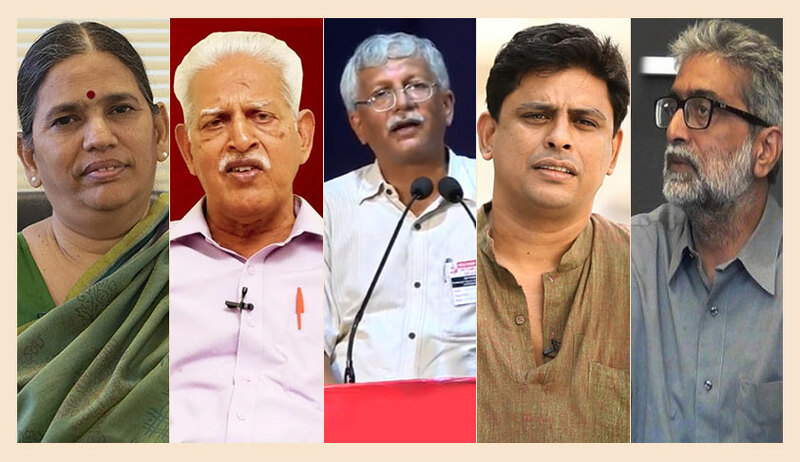 A bench headed by Chief Justice Dipak Misra and Justices Khanwilkar and Chandrachud ordered the house arrest of the five rights activists–Varavara Rao, Arun Ferreira, Vernon Gonsalves, Sudha Bharadwaj and Gautam Navlakha– at their respective homes till the disposal of the petition. The issue has genesis in the multiple arrests and raids carried out by Pune police yesterday in several cities. The activists were arrested for their alleged Maoist link triggerring Bhima-Koregaon violence in Pune on January 1, 2018. Gautam Navlakha is a civil liberties activist, who had association with People's Union for Democratic Rights. He is an editorial consultant of Economic and Political Weekly. His residence in Delhi was raided by Maharshtra police on August 28. The police arrested him and secured a transit remand from a Saket court to take him to Pune. The remand order was stayed by the Delhi High Court yesterday. Today, the bench of Justice Muralidhar and Justice Vinod Goel heard the matter in detail. After finishing hearing, the Delhi HC had started dictating order in the petition. Meanwhile, the SC passed the order in the petition filed by Romila Thapar and others. On knowing about the SC order, the Delhi HC bench halted the proceedings and posted the matter tomorrow to know about the contents of SC order. Lawyer-activist Sudha Bharadwaj, who is known for her trade-unionism and civil rights activism in Chattisgarh for almost three decades, was arrested from her house at Badarpur in Haryana yesterday. Immediately after her arrest, a habeas corpus petition was filed in the Punjab and Haryana High Court. The HC ordered that she should be kept at her house till the Magistrate decided on the transit remand. The HC also directed that the Maigstrate should examine compliance of provision of Section 41 and 50 of the Code of Criminal Procedure by the police before issuing transit remand. However, by the time the High Court order came, the Chief Judicial Magistrate Faridabad had granted transit remand of Bharadwaj to Maharashtra police. Following the HC directive, the CJM recalled the first order, and held that she should not be taken out of Haryana until August 30, on which date the HC is set to consider the habeas petition again. Varavara Rao is an 78 year old Telugu poet. He is known for his poems calling for revolution by the workers' class. He founded a group of revolutionary writers named "Virasam". He had undergone imprisonment several times for his radical ideas.